The Hunger Free Communities (HFC) Summit is an event I look forward to every year. It’s when I get to visit with so many of the people that I interact with by phone and webinar throughout the year. 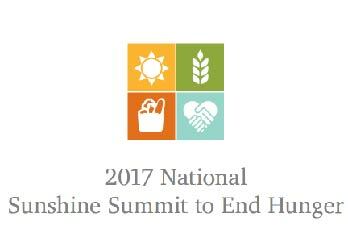 On November 6th and 7th, the Alliance to End Hunger partnered with Tampa Bay Network to End Hunger to host the 2017 National Sunshine Summit to End Hunger in Tampa, Florida. This two-day event brought together the Alliance’s Hunger Free Communities Summit with Tampa Bay Network to End Hunger’s annual conference. 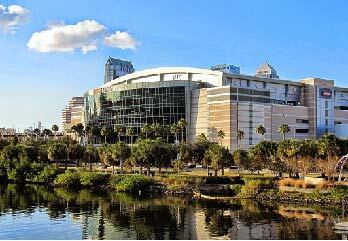 Held at the hockey arena, generously donated by the Tampa Bay Lightning Foundation, the combination of warm weather and cool venue made for a unique conference experience for the over 160 guests. It felt like a reunion, greeting friends from around the country, as well as an opportunity to make new friends. I was thrilled to meet the Alliance AmeriCorps VISTA Members in-person for the first time since they started working at various HFC sites in August! To kick-off the event, 250 volunteers participated in packing 85,000 meals for local Florida residents. The energy of the volunteers at the plaza of the Amalie Arena carried through to the conference participants who gathered from all around the country. Seventeen Hunger Free Communities Network coalition partners were in attendance, as well as five aspiring hunger free groups from Alabama, Illinois, Massachusetts, Mississippi and Ohio. I am thankful that Hunger Free Heartland, San Diego Hunger Coalition, Texas Hunger Initiative, Indy Hunger Network and Kalamazoo Loaves & Fishes contributed to the Summit content. There were twenty-two workshops to choose from covering topics from hunger’s connection to health and race, to strategies for addressing hunger among seniors and children, to the systemic challenges of food recovery and achieving zero hunger. New tools and resources for the HFC Network were presented highlighting partnerships with the Academy of Nutrition and Dietetics, Syracuse University and Taproot Foundation. Local and national experts lead workshops including representatives from Alliance member organizations, like AARP Foundation. As one of the organizers of this event, I always hope people will make great contacts, learn about new ideas to implement and walk away with tools and resources to help their communities. I was thrilled to see we met those expectations and more. Many of you have told me how inspirational it was to be in the company of anti-hunger champions who are “doing the work.” At this event, I always feel connected to the larger purpose of our work-building the public and political will to end hunger. It’s an exhilarating feeling and helps to energize me until the next time we meet. I want to thank Tampa Bay Network to End Hunger for being a great partner and our sponsors General Mills, Monsanto, Bread for the World, Feeding America, Islamic Relief USA and Share Our Strength! I look forward to seeing you all again at next year’s summit.